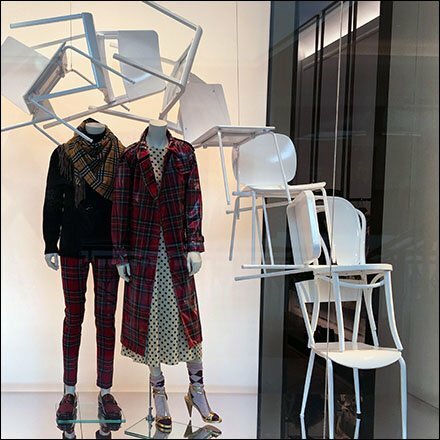 Though having little to do with the Season, this Burberry Winter Plaid Window Chair Cascade was nevertheless stunning and attention compelling. I might recommend for Back-To-School promotions, but enjoyed the creativity nonetheless and thusly share with you.Plus it does tie into the FixturesCloseUp benches and seating thread of posts below. This Burberry Winter Plaid Window Chair Cascade seen at the King of Prussia Mall, Philadelphia, Pennsylvania.